I’ll cover them in depth later in this post, as well as offer a couple of other attractions, places to eat and places to stay. 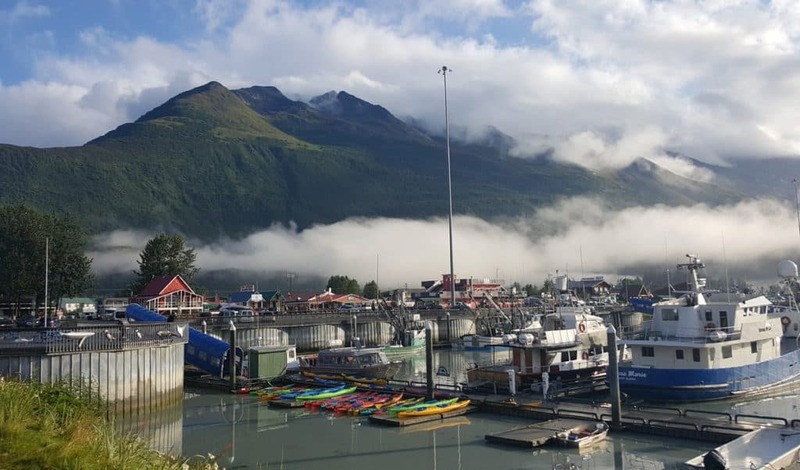 Valdez, Alaska is a small town of only a few thousand people, but the location in the Chugach Mountains along with the history allows for plenty of fascinating things to see and do. Variety is a good description of the many activities that can take place in Valdez. First of all, the area is simply gorgeous. Mountains and sea meet in this area as the ocean sends the Valdez Arm into the continent. Being near the ocean means there’s a lot of rainfall and weather can be gloomy even in July and August. However, it also means everything is green and there are waterfalls literally everywhere you turn your head. I’ve never seen so many waterfalls surrounding one single town. Valdez has its share of history too. The town was nearly destroyed in the Big Friday earthquake of 1964. To stay safe, the survivors had to literally move the location of the town further inland, where the soil was more stable. Valdez is also where the famous Alaska Pipeline reaches port. This ice-free port is where oil tankers get filled up with the precious black gold, to take it further down in its journey to the refineries in the Lower 48. 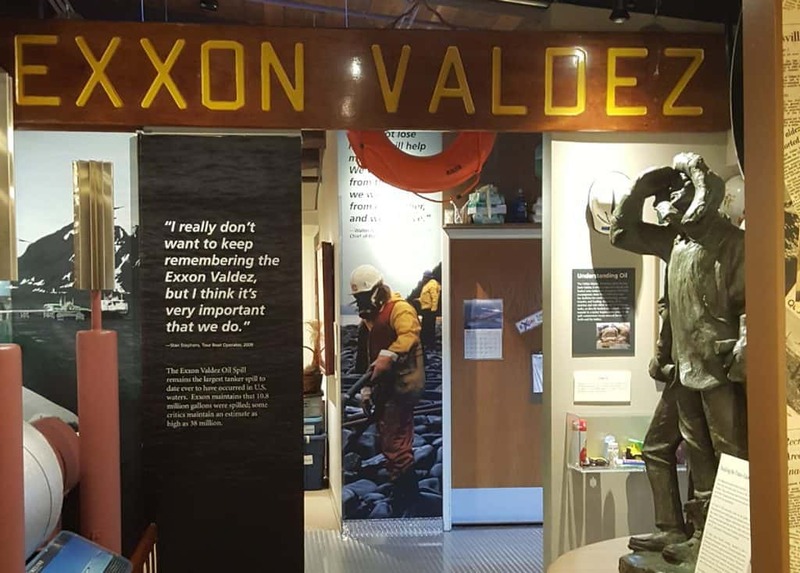 In 1989 Valdez made the headlines again as the Exxon Valdez tanker experienced a major oil spill which affected the coast of Alaska for years to come. 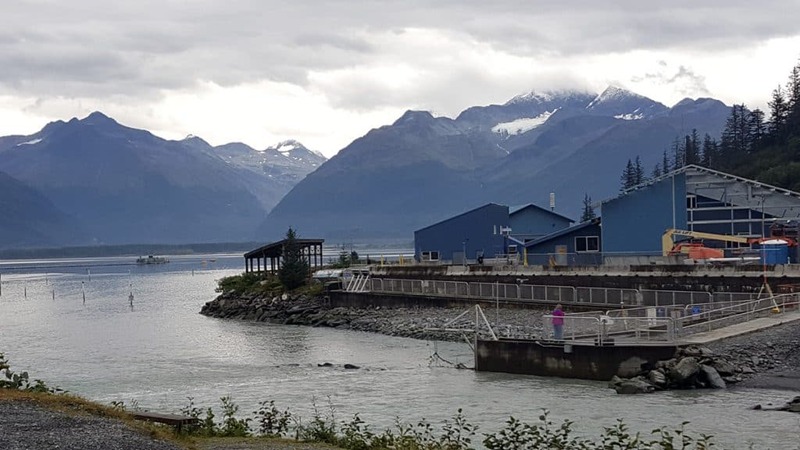 Fortunately, the oil spill never made it to the shores of the town itself but if you recognize the name Valdez, that accident may be the reason for that. 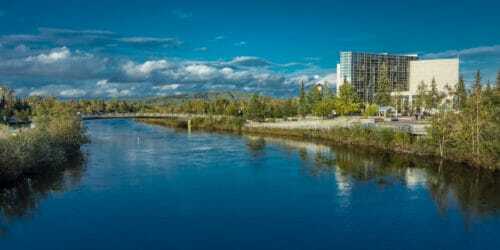 So, yes, Valdez is anything but boring! We spent three days exploring the town and it’s definitely on our list of places to return to! 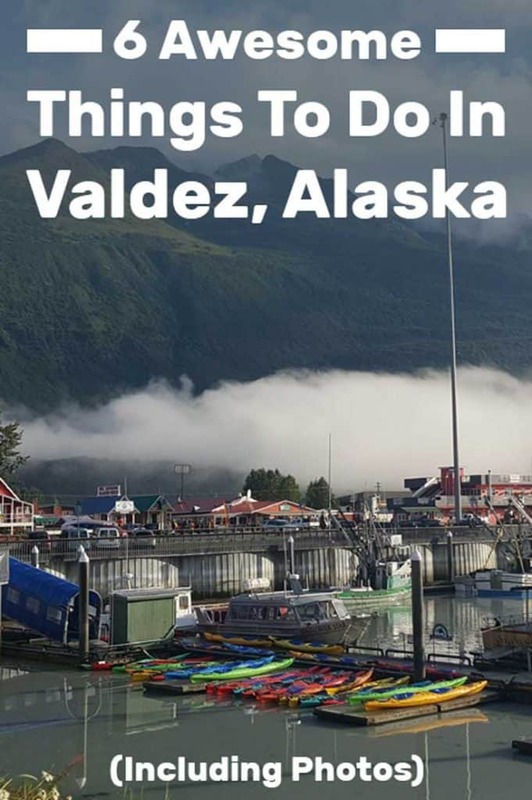 Here’s my list of must-do things while visiting Valdez. 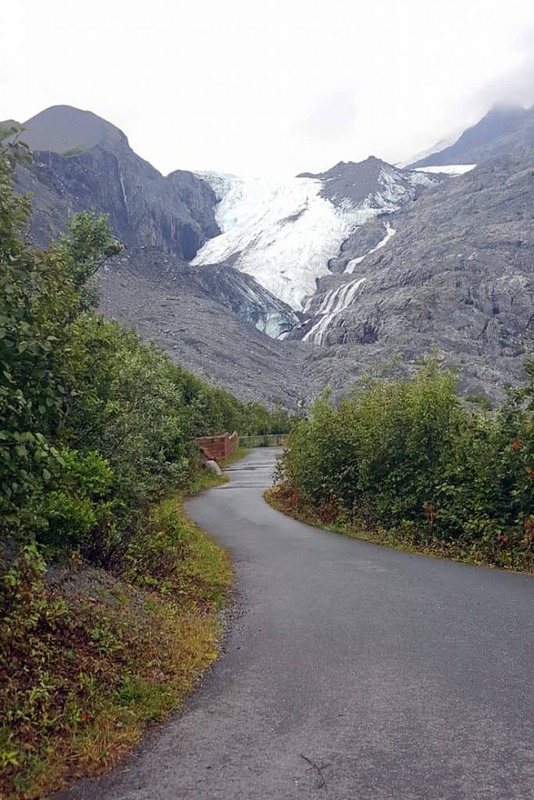 Designated as a world heritage site in 1968, the Worthington Glacier can be found on Richardson Highway at milepost 28. For us, catching that first glimpse of Worthington Glacier was super exciting. It’s clearly visible from the road and we totally ignored the light rain and cloudy weather (in August!) and pulled over for a closer look. There was a spacious parking lot (with a surprisingly small number of vehicles parked already). We didn’t make it all the way to the glacier because it was too cold and drizzly but this was still a very worthwhile stop. It was also evident from the hiking path that getting to the glacier itself would take time. 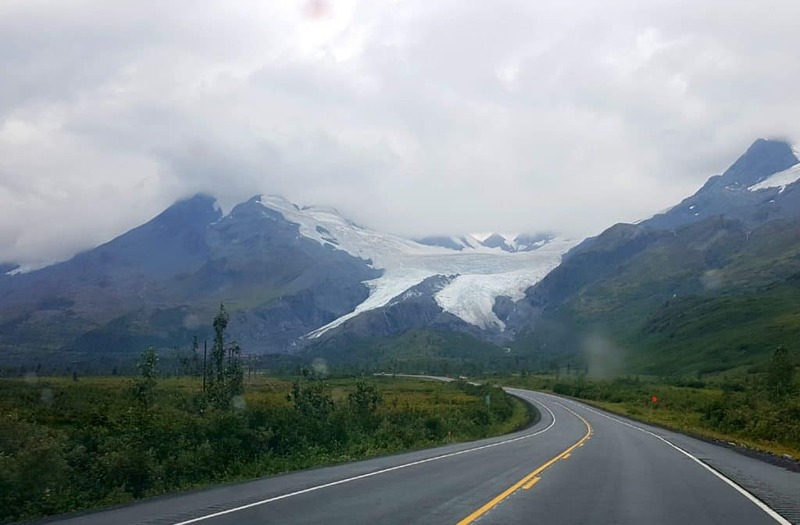 These glaciers tend to recede at alarming rates, so even if you read about how close the glacier is to the road, it may not be that close when you get there. If you really want to get close and intimate with the glacier, you can. Guided ice climbing tours are available and will give you a chance to see views one wouldn’t ordinarily see. You’ll be driving through Keystone Canyon as you get to Valdez. The road goes through it. And it’s totally breathtaking. This short span of the road is easily one of the most scenic road sections we had ever driven on. In fact, if I had to rate my top 10 most beautiful road sections, it would only come second to the Going To The Sun road in Glacier National park during snowmelt. I’m not that good a writer so I won’t pretend to capture the beauty of the place in any poetic way but here’s a short factual description: You’ll be driving through a narrow canyon with literally dozens of waterfalls coming down to your level – all accumulating into the small stream by the road. Gorgeous. Plan to take your time driving through the canyon as you may be pulling over several times to see the sights. 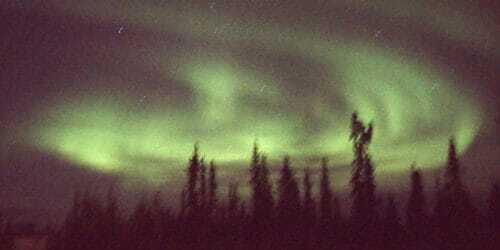 And again, you’ll be seeing this just coming into Valdez and when driving back out again. So no need to go out of your way – the canyon is there. As you pass through Keystone Canyon into Valdez, you will be able to access the falls at miles 14 through 17. Interestingly, the hike covers two miles of a restored section of the trans-Alaska Military Pack train trail. Be sure not to miss the overlook about a mile up the trail. This gives you photo opportunities from above the falls. To get even closer to the Bridal Veil Falls, one can kayak the Lowe River which runs in front of the beautiful falls. Unfortunately, it was raining when we visited so we chickened out of hiking. But – we did promise ourselves that we’ll be back to Valdez for a longer stay. Someday. And we’ll hike Bridal Veils Falls trail then! Additionally, in the winter, ice climbing gives one another unique view of the falls. Another set of falls that can be viewed in the same area are the Horsetail Falls. 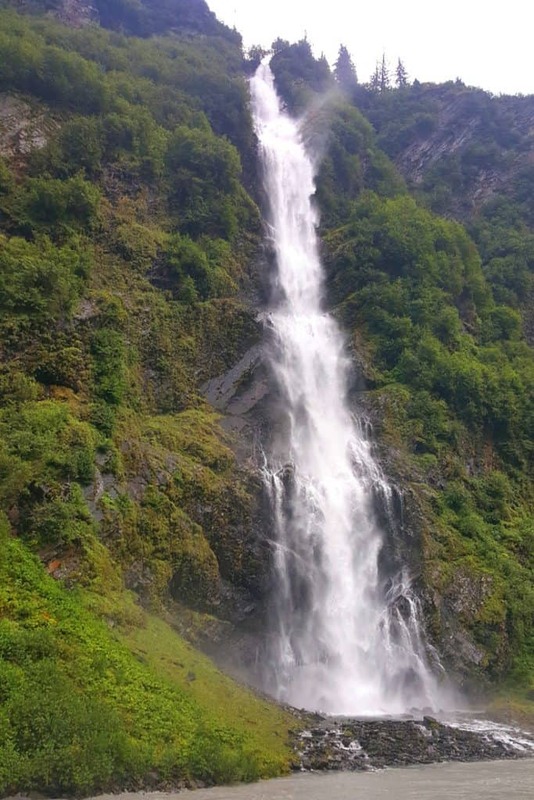 For more helpful information about the falls and Valdez, check out this site. 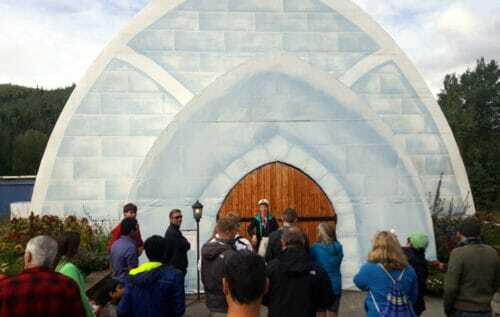 Glacier cruises set out from Valdez to see the Meares or Columbia Glaciers. The price may range from $135 to $170. Additionally, folks may enjoy a light meal or snacks on the trips, some of which may last a day. Often, porpoises, puffins, or sea lions may make their presence known. 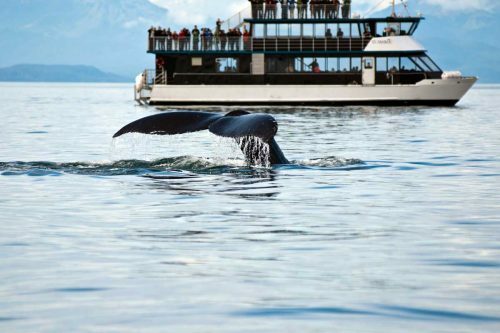 Some visitors report seeing Minke whale and mountain goats while on the cruise. For more information, take a peek here. 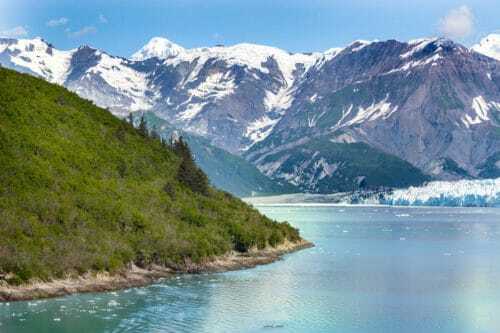 I have no doubt these cruises are beautiful but we could only budget for one cruise on our trip and chose to take the one in Kenai Fjords National Park. If we could budget for another, it would have been from Valdez. This museum occupies two facilities in Valdez on Egan Avenue and on Hazelet Avenue. Only one fee is needed to visit both of them. Permanent exhibits include Native Cultures, the Gold Rush, Exploration, and Glaciers. We took a couple of hours to see the museum and did not regret that. It’s a small-town museum but Valdez has so much history and the place does a decent job of showing that. 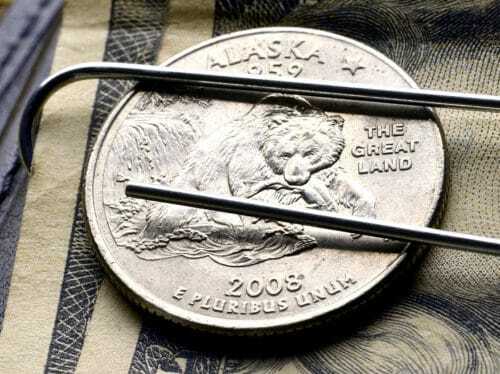 Everything was covered, from early gold rush days to the earthquake and the Exxon-Valdez oil spill. Definitely go there if you have even an hour to spare. The hatchery is responsible for maintaining a sustainable population of salmon for the needs of wildlife, tourists, and fishermen. It released the first pink salmon fry in 1982. We didn’t take the tour but you definitely can. They also have information available via touch screen videos etc. If you’re here when the Salmon returns, this is a must-see place. 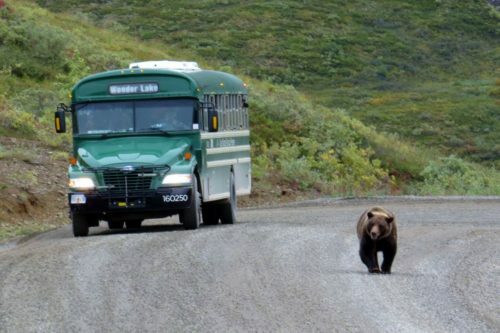 We actually went twice while staying in Valdez for the fantastic wildlife viewing. The fish return in such huge numbers they literally overflow on the beach and nearby streams. We could see dead salmon on the roadside in huge amounts. The streams were literally packed full of salmon, like sardines in a tin can. Note the salmon in the water – and out of it too. Right across from the Salomon Gulch Hatchery. By the stream we saw a black bear, just sitting there. I think it was waiting for its stomach to process the last fish meal and make room for the next one. In the water near the hatchery, there were sea lions just sitting there with their mouth open. Honestly, fish were jumping into those gaping mouths. 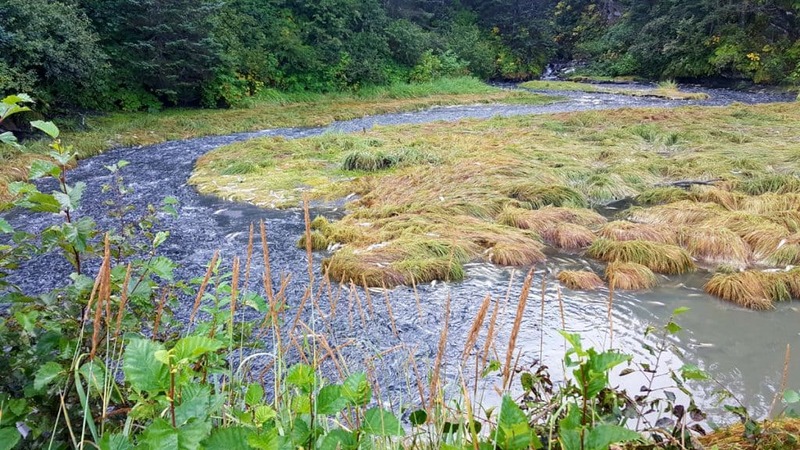 We’ve seen salmon migrating in other places in Alaska but this was totally crazy. Don’t miss out on this sight if you’re in Valdez. To see the hatchery, head north out of New Valdez and turn on to Dayville Road off of Richardson Highway. The sights make the fifteen-minute trip worthwhile. 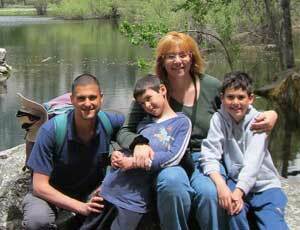 For more information on the Solomon Gulch Hatchery, go to this website. 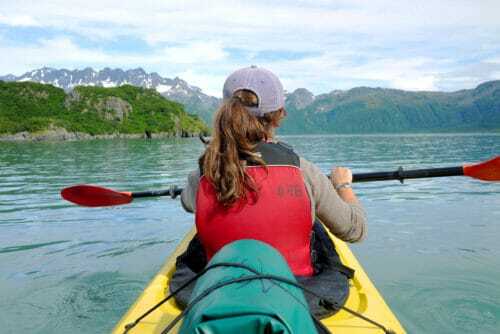 What else is there to do in Valdez? While researching for this post, I also came across these two items. Haven’t tried them yet but figured I might as well share the information. The Whitneys moved to Alaska in the 1940s. Originally selling items native to Alaska in a gift shop, they purchased a museum and strove to preserve the heritage of Alaska. Although the museum is open during the summer, visitors must call ahead during the winter season. There is no admission fee, but donations are accepted. Some of the items visitors can hope to view are animal mounts, native masks and dolls, furs, and ivory. 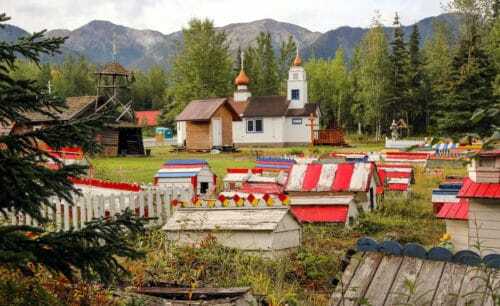 Additionally, visitors state they enjoy the artifacts that show the customs of Alaska. For more information, check out the website. For those who wish to see Alaska from a unique perspective, helicopter tours are available in Valdez. With a range of prices are different tour lengths. The tours may range from 35 minutes to over two hours. Some tours include landing on glaciers. Additionally, wildlife can be viewed from these tours. If you think the bird’s eye view is for you, check out this website here. Valdez is small and the nearest city is hours of driving time away, so it’s good to know where to get decent grub while visiting. We’re not foodies, I’m afraid, so the following recommendations are based on reviews I’ve read – not experience. The Roadside Potatohead overlooks the harbor in Valdez and is a popular spot. Open May through Sept, the pale green restaurant with its pots of flowers invite you in for a morning cup of joe or for lunch or dinner. Several of the meals have potatoes incorporated into their recipes such as the Potatohead Burrito or the plate of Spudniks, which is a biscuits-and-gravy dish with fries substituted for the biscuits. This inexpensive eatery has a diverse menu also featuring seafood. Check out more details here. If nothing will do but a good burger, try Old Town Burgers. It might be best to go during off hours as there are often lines out the door for this quick comfort food. On top of it all, the service is fast and the coffee is free. Take a look at their Facebook page here. If you’re looking for fast food, Alaska Halibut House is the place to go. This restaurant offers halibut as well as popcorn shrimp. The ambiance is anything but fast food with its soothing lighting and calming atmosphere. Have a look at the restaurant website for more details here. What Nightlife Hotspots Are in Valdez? 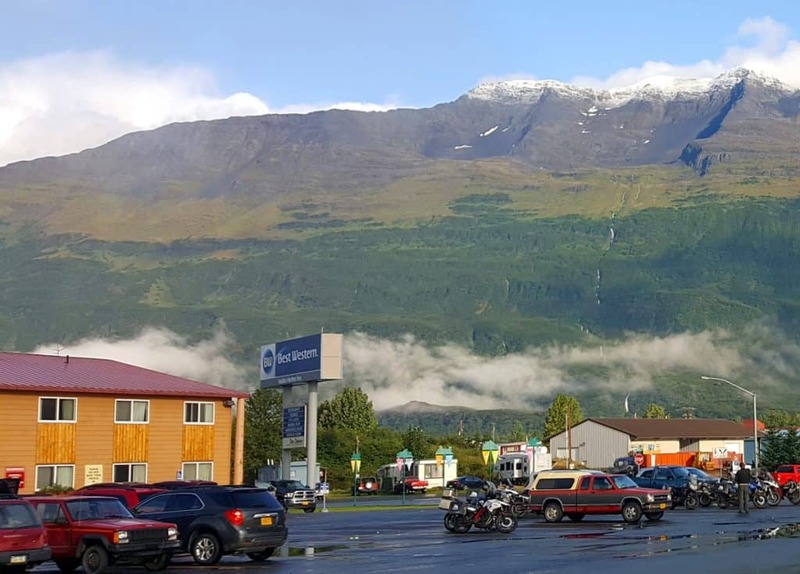 Valdez is a small town, but there are still a couple of places to go for a taste of Alaskan nightlife and a chance to mingle with locals. This nightspot offers cocktails, burgers, and live music for the enjoyment of locals and tourists alike. Visitors submitted reviews with five-star ratings for Puddle Jumpers. For more information, check out their Facebook page here. Where would you expect to find a fat mermaid? Near the water, of course. The Fat Mermaid has views of the marina in Valdez to enjoy while visitors enjoy pizza and burgers along with their beer. They also take orders online. For more information and an online menu, check out the Fat Mermaid’s website here. This is where we stayed while visiting Valdez. By booking almost a year in advance, I managed to get decent rates for a room for four. It wasn’t a large room but overall the hotel was decent and breakfast was actually very good. Plus, the views right outside the hotel, on a semi-sunny morning, were pretty amazing! Despite the small population of the town, this hotel has an on-site restaurant and business center. The hotel lives up to its name with the restaurant looking out onto the harbor. Located close to the harbor, the hotel is designed in rustic style with beamed ceilings and stone fireplaces in the lobby. The rooms offer wide panoramic windows for the views. 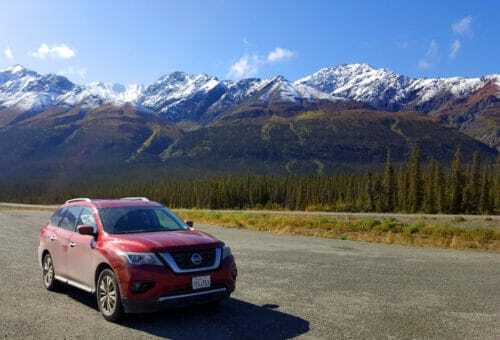 (And if you’re looking to learn more about getting those lower rates, check out my post about the cost of a trip to Alaska, including budgeting tips). This hotel offers free shuttle service along with free Wi-Fi. Also, a laundromat is available if needed. The front desk is open 24 hours, making early/late check-ins a convenience. Following a good, hot coffee and continental breakfast, visitors may set off to explore the town as the hotel is within walking distance of different sights. From .02 to 1 and 1/2 miles, there are rivers, mountains, and the ocean to see. The House on the Rock specializes in comfort. With free Wi-Fi and a continental breakfast, the family-owned business provides information about area events. This bed-and-breakfast is convenient to several sights and attractions. Visitors rate the establishment highly in service, comfort, and cleanliness. The House on the Rock B and B scores highly in guest reviews. To book here, check out this web page. 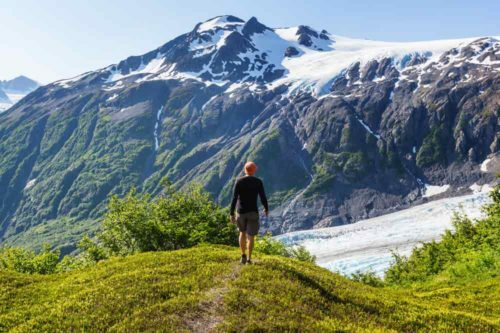 Previous PostWhen Is the Best Time to Visit Alaska?